Richard Bruton TD, Minister for Jobs, Enterprise and Innovation, recently visited DIT Grangegorman to see the new research and innovation building currently being constructed by BAM. 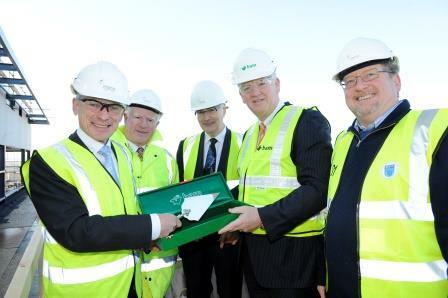 Following a tour of the building, the Minister laid the ceremonial final brick to signify completion of the structure. Fit-out of the interior will now take place and the building will open in January 2016. The new building will provide a range of research laboratories and facilities for the Environmental Sustainability and Health Institute (ESHI) in areas that include Social and Educational Research; Health Informatics; Bioengineering; Molecular and Cell Biology; Analytical Chemistry; Food Safety/Quality; Energy Lab; and Vision Sciences. The DIT Hothouse incubator and knowledge transfer activity will also be located in the building, with a mix of own-door rentable units of varying sizes for High Potential Start-ups (HPSU), hot desk zones, training and meeting rooms. The building was designed by RKD Architects.